Possibly the greatest display of white-ruled South Africa’s technological capability came with its development of nuclear weapons. 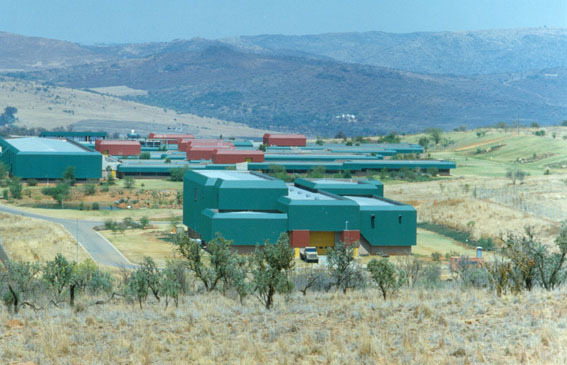 The casings for South Africa’s nuclear weapons, photographed at the Advena facility, near Pelindaba. Six weapons were completed, and a seventh was under construction when the project was halted. White South Africa built six atom bombs by 1989 at the Pelindaba nuclear research facility which was to the west of Pretoria. In 1989, the ruling National Party decided to hand power to black majority rule, but did not wish to see the weapons handed over to either a black government or one of the African National Congresses’ allies such as Libya. The weapons storage safe, buried deep underground, at the Advena facilty near Pelindaba outside Pretoria. These were the weapon storage lockers used for holding the assembled nuclear weapons. The nuclear weapons project serves as testament to two important facts about white South Africa. Firstly, it is yet another proof, if any was needed, of the falsity of the “environmental” theory of development. South Africa did not develop nuclear technology “just because” of its geographic location. The development was possible because of the race of the people who lived there, and had nothing to do with the geography, climate, or any other factor. Secondly, the fact that white South Africa developed these weapons for supposed use against its enemies, shows the delusion under which the apartheid leaders lived. The policy of apartheid guaranteed that white South Africa would inevitably be overrun with blacks, and the possibility of using these weapons in any operational theater was, therefore, nonexistent. White South Africa’s reliance on black labor meant that no matter where such a weapon might be aimed, whites and blacks alike would be targeted. - The South African nuclear weapons project was publicly acknowledged in March 1993 by then state president F.W. de Klerk. It was only announced after the weaponry had been fully dismantled and the core elements destroyed or removed. 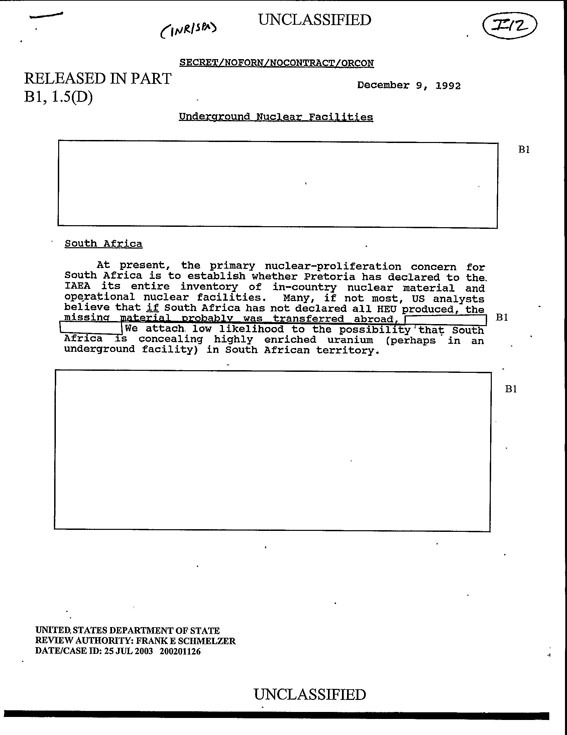 - The United States supplied South Africa with its first supply of Highly Enriched Uranium (HEU) for use at the Safari-1 research reactor, commissioned in 1965 at Pelindaba. 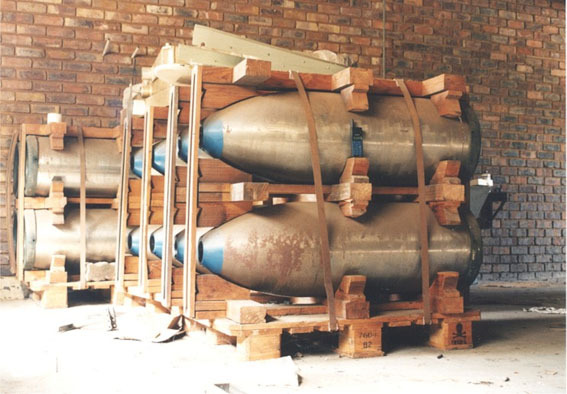 The US supplied South Africa with about 100 kilograms of weapon-grade uranium fuel until 1975, when anti-Apartheid sanctions stopped the shipments. - Apartheid South Africa then turned to Israel for further assistance with its nuclear weapons programme. It is still a matter of debate as to how much technology Israel supplied, but it was probably limited to tools rather than actual weaponry. - South Africa stated its own HEU enrichment program in a small warehouse in central Pretoria. As it became more sophisticated, larger premises and stricter security were needed, and in the mid-1960s, the project was moved to Pelindaba. - At the same time, South Africa started developing commercial applications for nuclear power plants, and in 1976, construction was started on the Koeberg nuclear power station to the north of Cape Town. Apart from providing electricity, Koeberg provided plausible deniability for the Pelindada research station. - In 1970, the South African government announced that it was building the “Y-Plant at Valindaba,” located next door to Pelindaba. The Y-Plant was commissioned in 1974 and started producing HEU in 1978. - In 1977, South Africa’s Atomic Energy Board (AEB) produced a first full-scale gun-type nuclear device prototype (as opposed to a just a ballistic test device) without an HEU core. This 3 ton bomb, was only meant to demonstrate feasibility of the weapon, and never for actual use. - In 1973, a group of scientists working at the Sonchem facility in Somerset West, produced the mechanical subsystems for a gun-type nuclear device. They successfully tested their design in May 1974, which proved that a nuclear explosive was feasible. - The Sonchem success convinced the AEB to upgrade the Pelindaba facility, and by 1977, had constructed a facility in “Building 5000,” and the Sonchem team was transferred to the Pretoria area. In this building, the gun-type device was successfully test-fired using a natural uranium projectile in 1976. - Building 5000 contained a pulse reactor for the experimental verification of theoretical computer models. In 1979, the reactor was used as a fast critical assembly in an experiment often referred to as "tickling the tail of the dragon" that proved the design of the gun-type device. The reactor was never again used as a pulse reactor and the facility was shut down in the early 1980s. Building 5000 at Pelindaba, where the "Melba" device was given its "dry run." - Building 5100 contained the control room for Building 5000, offices, research and development laboratories and machining facilities for uranium, particularly buildings 5100 and 5200. - Building 5200 housed a critical facility to verify separately the multiplication factors of the two parts of a nuclear explosive device, providing confidence that the gun-type design would work. The first nuclear explosive device was also assembled in this building in 1979. - Building 5300 was designed exclusively as a laboratory for high explosives. 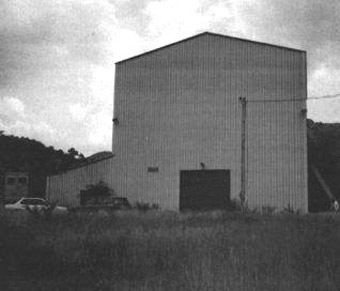 Small quantities of high explosives were pressed and machined into shapes at this facility. - By 1977, two test shafts (216 and 385 meters deep) had been drilled at the Vastrap military based outside Upington in the northern Cape’s Kalahari Desert, with the intention of conducting an “instrumented cold test” of the first prototype, using a depleted uranium core. This would have entailed a “dry run” for a real nuclear test. The test date was set for August 1977. The corrugated iron shed which covers the two test shafts at the Vastrap military base north of Upington. 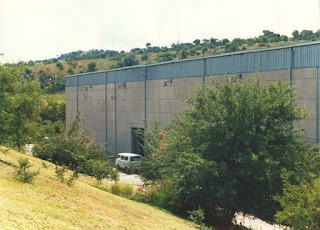 The shed was built in 1987 when Armscor considered reopening the shafts for tests after they had been abandoned ten years earlier following an international outcry. - The US government was officially — and secretly — informed of the plans to conduct the test. 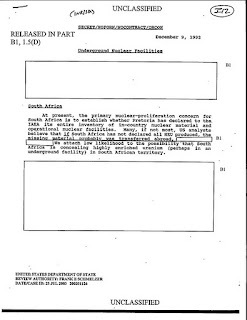 The American government urged the South Africans not to conduct the test, but (allegedly) kept the information to themselves. - The test plans were only abandoned when a Soviet spy satellite detected the preparations and the Soviets notified the US of the discovery. The US was forced to bring diplomatic pressure to bear as news of the project spread, with the French government threatening to cancel the contract for the Koeberg reactor (which was based upon French designs). 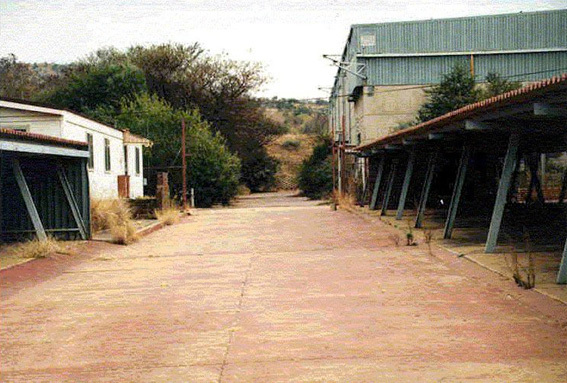 - The Vastrap test site was abandoned, only to be opened again in 1987 when the test shafts were inspected and a corrugated iron shed built over the holes. 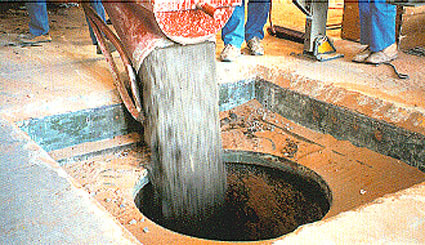 The test shafts were publicly filled in with concrete in July 1993. The Vastrap test shafts were filled in with concrete in 1993 under IAEA supervision. - By 1979, the Y-Plant had produced 55 kilograms of HEU (at 80% enrichment) which was made into a core for a second experimental device named “Melba.” This device was completed in 1980, and used in a “zero-yield test” (in which a nuclear chain reaction is initiated with negligible energy output). “Melba” was then stored in an abandoned coal mine at Witbank at a former military ammunitions depot, until it was moved to the Kentron “Circle” building near Pelindaba. - By 1979, the state run arms manufacturer, Armscor, was handed control of the project to develop full-blown nuclear devices, with the AEB (now renamed the Atomic Energy Corporation or AEC) providing nuclear materials and development work. - Armscor built a new facility, the Kentron Circle facility some 15 kilometers east of Pelindaba. The site, later renamed Advena, was commissioned in May 1981. A side view of the storage facility at the Kentron Circle building, taken when the facility was still in use. - At the Circle (“Advena”), Armscor extended the nuclear weapons programme from the gun-type weapons to inter-continental ballistic missile (ICBM) systems, and developed advanced warhead designs. - It was at Advena that cooperation with Israel reached its zenith. Scientists from both countries worked on at least two missiles, codenamed RSA-3 and RSA-4 (RSA= “Republic of South Africa”), both developed from Israel’s Jericho II ICBM. One of the RSA-3 missiles, meant for satellite launch, is today on display at the Swatkorps Air Force museum. The RSA-4 missile could, allegedly, reach any target within a 7,000 kilometer radius while carrying a 700 kilogram nuclear warhead. The RSA-3 missile, as can be seen at the Swartkops Air Force base museum. 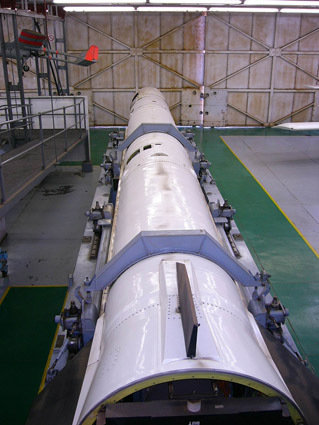 According to published data one of the missiles, the RSA-4, would have been capable of delivering a 700 kg nuclear warhead from its South African launch site to any point on earth. The RSA range of missiles were built around the same engines that power Israel's Jericho-II missile and its "Shavit" space launcher. South Africa ended its missile collaboration with Israel in 1992 and then halted all ballistic missile development in mid-1993. 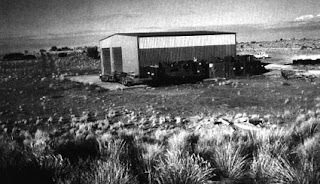 - The first floor of the Circle building had conventional workshops for making mechanical and electrical equipment; storage rooms; uranium casting and machining workshops; a large vault; integration rooms where portions of the devices were assembled; and eight "cells" for testing internal ballistics, propellants, igniters, and small quantities of high explosives for self-destruct mechanisms. - An explosive test chamber located in one of the cells could handle up to 2.5 kilograms of high explosive. It was also used to conduct plane-wave experiments with shaped charges and to develop high-speed instrumentation for preliminary work on implosion designs. Another cell contained the "pig sty," a wood enclosure where projectile tests were done for the gun-type device. - The designers put a "plenum" or large room above these cells. In an accident, this room would serve to dissipate the overpressure from an explosion, preventing the collapse of the roof or the walls. Holes at one end of the room would allow the explosion to vent. From the outside, the holes were disguised as ventilation ducts. - In the early 1980s, the program employed about 100 people, of which only about 40 were directly involved in the weapons program and only 20 actually built the devices. By the time the program was canceled in 1989, the work force had risen to 300, with about half directly involved in weapons work. A more general view of the Kentron Circle building, taken several years after the facility was closed down. It is empty today. 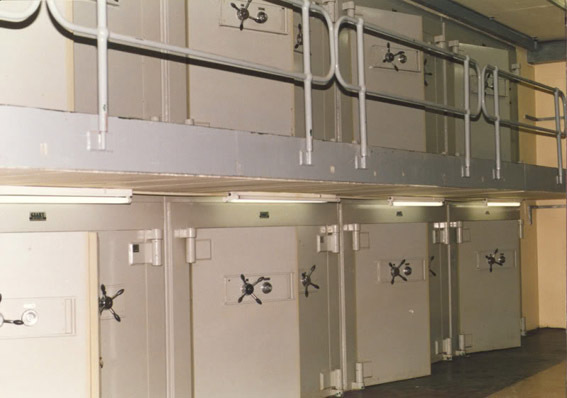 - The weapons storage facility at Advena consisted of a high-security vault with many smaller vaults inside. Each nuclear device was divided into two sections, a front and back. With the HEU distributed between the two halves, the design minimised the possibility of accidental detonation or unauthorised use. - A front and back end of a device were never worked on simultaneously. Both ends could leave the vault at the same time only after three top ministers and the head of government inserted their separate sections of the code into the vault. No one person had the complete code. - - The total mass of a completed device was about one metric ton. It had a diameter of nearly 65 centimeters and was about 1.8 meters long. Each device contained an estimated 55 kilograms of HEU. - In the mid-1980s, construction was started on a new facility, Advena Central Laboratories, close to the Circle building. This facility was intended to expand nuclear delivery options to ballistic missiles. Construction was completed just as the nuclear program was terminated. The Advena Central Laboratories, as they can be seen today. Commissioned to develop the nuclear ICBMs and other advanced weaponry, the facility was completed just as the nuclear weapons project was closed down. - The Circle building, and planned new facility, were closed down when the weapons project was abandoned. By September 6, 1991 all of the HEU had been removed from the weapons, melted down, and sent back to the AEC for storage. - Destruction of the major non-nuclear components of the weapons, detailed design drawings, and photos of components was completed by the end of 1992. The redacted part is most likely “to Israel” as there would be no other logical recipient of such material. This is an authoritative analysis of the neglected story of the South African bomb - yet it is one that holds important lessons for students of global nuclear disarmament. South Africa was the only state that voluntarily liquidated its nuclear capacity, which might have been Pretoria's lasting legacy to world peace. The West should use this model to ensure that Pakistan relinquishes its nuclear arsenal. A precondition of this should be bilateral disarmament between India and Pakistan. This may be ensured by : (a) ending all aid to the sub-continent until both disarm (b) imposing a trade embargo on both states (c) withholding assistance to Pakistan in resettling its unwanted migrants from Britain and the West (d) imposing a sterile contaminated 'death strip' on the Afghan border with Pakistan. Thereafter, once the Iranian bomb has been neutralised, the Israelis will be compelled to disarm their nukes. China must be drawn into the U.S./Russian Federation nuclear disarmament programme. I disagree with the author's comments on the futility of the South African nuclear deterrent. This was adopted (with U.S. connivance) as a means of deterring the 'frontline states' from any invasion of the Republic. NATO invested heavily in the strategic defence of the Cape seaway with the secret Silver Mountain intelligence complex south of Cape Town and the provision of submarines and maritime patrol aircraft for the S.A. Defence Force. The 'constellation of autonmous' Bantu statelets, providing a migratory workforce, was the underlying rationale of the separate development constitution. There was, of course, no intention of deploying nuclear weapons within South Africa itself. The criticism of European settlers in southern Africa relying on a 'benign helotry' does, I believe, ignore historical realities. There was, if the sub continent was to be opened up to trade, agriculture, mining and commerce, simply no alternative to imposing European minority rule. The Germans tried extermination in Sud West Afrika against the Hereros, but a Christianised (and the ubiquitous missionaries exerted undue pressure on colonial and imperial governments) settler population had no other choice but to rule fairly and attempt to 'civilise' the indigenous with public works, health care and rudimentary education. That this meant that the Bantu population of Rhodesia soared from a quarter of a million in 1890 to 16 million in 1990 is just unfortunate. Europeans had actually arrived in the Cape before the Bantu. Had the Cape Colony remained in Dutch, Afrikaaner hands, just possibly, the Bantu tribes could have been pushed north of the Limpopo - and, under a more ruthless Rhodes, farther north of the Zambezi. The forces of nature also militated against substantial European settlement in southern Africa as the tradewinds, and the inhospitable eastern Cape/Natal coastline, meant it was easier to colonise the Antipodes than the sub continent. Possibly the hardy Boers, energised by large families, could have farmed the Transvaal and the Free State without reliance on Bantu labour - but the goldfields and rapid undustrialisation demanded manual labour from the tribal lands.